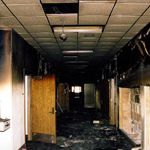 We can handle all fire damage repairs regardless of size. Whether a fire took place inside the home or nearby, smoke damage may occur. For example, it’s not uncommon for homes untouched by a wildfire’s flames to suffer extensive smoke damage. Soot and ash can cover interior walls, floors, draperies, and furnishings while a lingering, and unbearable, smoke odor can permeate the home. Count on us to assess and remediate smoke damage. Soot and smoke cleanup, demolition, and rebuilding are among the many specialized services we offer after a fire.